Gifts from the Pirates: "I like to see life with its teeth out." Over the last few months Opeie has become a nightmare with both bathing and brushing his teeth. The bath thing i can kind of understand, he was fine until he moved one day when Mrs M was washing his hair and he got most of a cup of water in his eyes so i think when he gets in the bath now he is quite anxious about that happening again. Luckily were both very patient parents so we will get him back on track soon. The tooth brushing saga seems to be coming to an end now with the help of some special toothpaste that Opeie seems to like and the Aquabats super show. It has become Opeie's and Seth's favourite show. Weve had a few off days but that's mainly down to teething issues but overall he is getting a lot better. It does also make things easier when Seth is next to him brushing his pegs too. 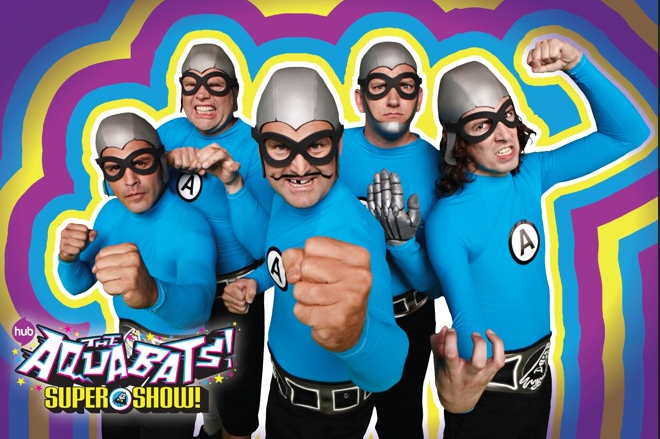 I love the aqua bats!